New spacious apartment in the heart of the historic center (Downtown / Baixa) with balconies, 2 bedrooms, 2 bathrooms, 2 living rooms, and kitchen. The price includes a 50% reduction for the soft launch (we're still adding furniture and decoration items) and due to renewals going on in the staircase. If a spacious, stylish urban apartment for a group or family is what you’re after, this 102m2 apartment offers the absolute best in location, value, and comfort for up to 4 guests! Located in a listed building dating back to the 18th century, this stylish urban apartment is ideal for those who want to explore Portugal’s fascinating history and beautiful surroundings. Set in a quiet area of the outstanding Baixa/Chiado district, the apartment is within a short walking distance of the main tourist attractions. This spacious and comfortable luxury 6th-floor apartment (no lift!) has been exquisitely renovated and decorated, is always spotlessly clean. The three bedrooms have comfortable double beds combining quality wooden floors with great beds. There are 2 bathrooms - one with a bathtub, the other has a shower - with great design. The kitchen is fully equipped and is in a beautiful open plan space. The street address is Rua dos Douradores, conveniently located at Baixa/Chiado between the major tourist streets of Lisbon: Rua Augusta, Rossio, and Terreiro do Paço. With so much waiting just outside the door, you are bound to spend your days exploring and enjoying Lisbon's magic. 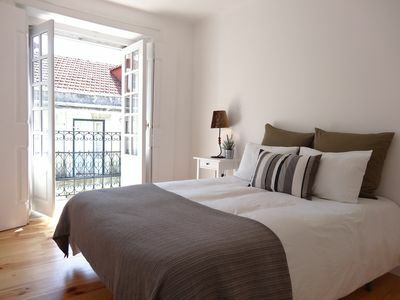 This fantastic apartment is the perfect place to relax and unwind in after busy days in the remarkable city of Lisbon. CAUTION: it is on the 6th floor and has no lift. Metro stations Baixa/Chiado and Rossio are down the block as are, amongst a selection of appealing shops, restaurants, and cafes, many key-route bus and tram stops, and the train station. Paid surveilled underground parking places at less than 500 meters: Grandella, Praça da Figueira o Praça do Município.